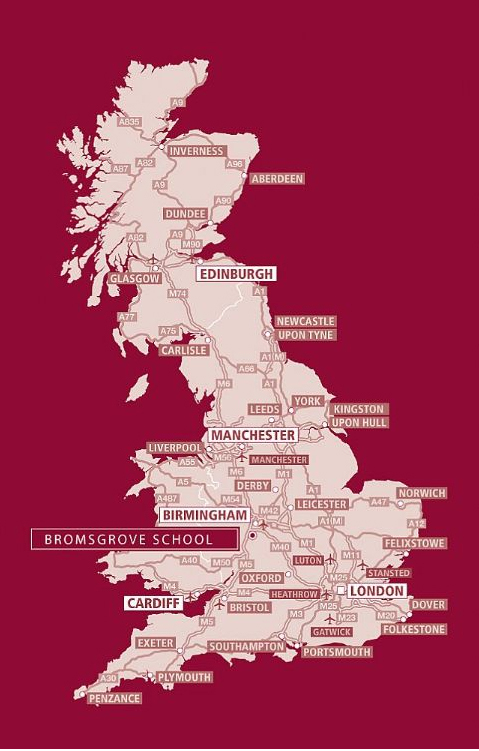 Bromsgrove School is situated in the Worcestershire town of Bromsgrove, England. It is set within its own 100 acres of grounds just out of the town itself. It is ideally located for local, national and international travel to/from the city of Birmingham and its surrounding areas, Birmingham International Airport, London Heathrow and Gatwick Airports. 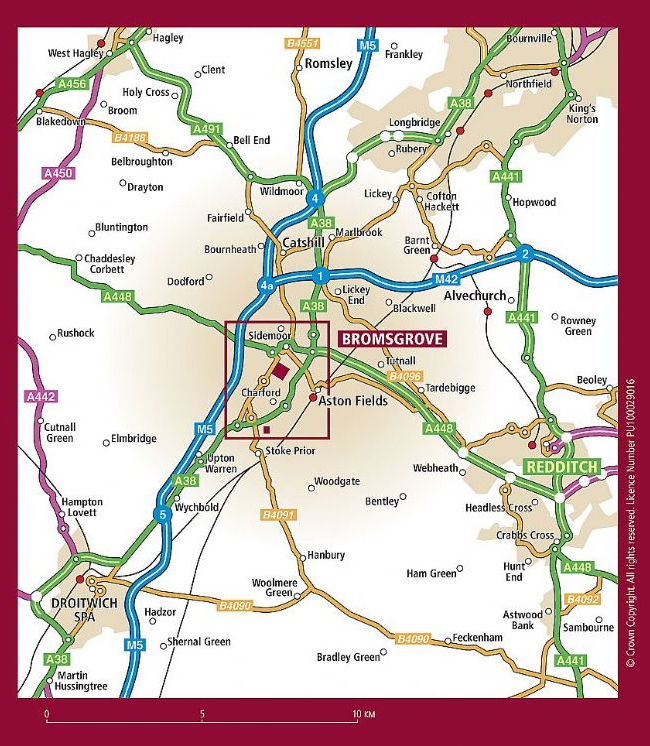 Bromsgrove is also close to excellent road and rail links (the town has its own railway line), such as the M5 and M42 motorways and Birmingham train stations. A comprehensive map is available, please telephone the School who will post you a copy by return, or follow the written directions shown below. These directions may be printed off by clicking the print command under the file menu of your web browser. Follow the A38 past Webbs of Wychbold (Garden Centre) to the roundabout at Stoke Heath. For Senior School: Turn left (B4094 and then B4091). Climb and descend Rock Hill for ½ mile going straight over the mini-roundabout at the Junction with Charford Road and passing the Labour Club on the left. 250 metres further on turn right through the main School gates (South Gates) which are set back from the road. Park by the Sports Hall and follow signs to Reception. For Preparatory School: Follow A38 past Webbs of Wychbold to the roundabout at Stoke Heath. Turn right onto the A38 Bromsgrove Eastern Bypass. At the third set of lights and after 1½ miles, turn left into New Road. Turn immediately first left into Bant Mill Road which becomes Old Station Road, the entrance is 200 metres on the left. For Pre-Preparatory & Nursery School (Avoncroft House): Follow the A38 past Webbs of Wychbold to the roundabout at Stoke Heath. Turn right onto the A38 Bromsgrove Eastern bypass. At the first set of lights turn right into Hanbury Road. The sign for the Pre-Preparatory and Nursery School is visible on the left. Turn left into driveway. From the M5 J4, follow the A38 Bromsgrove signs for 1½ miles past the Marlbrook Inn, over the M42 roundabout and past the Harvester Inn. (M42 directions start here) Stay on the A38 towards Bromsgrove, descend the hill (Eastern Bypass) through one set of traffic lights to a large roundabout. Take the third exit signed the A38 and continue on the Eastern Bypass••. For Senior School: At the second set of lights filter right into Charford Road (KFC is then on the left). Pass South Bromsgrove High School (SBHS) on the right and proceed to the mini-roundabout. Turn right into Worcester Road and pass the Labour Club on the left. 250 metres further on turn right through the main School gates (South Gates) which are set back from the road. Park by the Sports Hall and follow signs to Reception. For Preparatory School: At the first set of lights filter right into New Road. Turn immediately first left into Bant Mill Road which becomes Old Station Road, the entrance is 200 metres on the left. For Pre-Preparatory School: Stay on A38 Eastern Bypass passing through two sets of lights. Go straight over the next roundabout (Morrisons supermarket is on the left) and climb the hill. At next lights take the filter lane left into Hanbury Road. The Pre-Preparatory and Nursery School is immediately on your left. At the lights where the Birmingham Road crosses the Stourbridge Road, turn right (directly in front is Thomas Horton Solicitors) into Market Street. Pass St John's church (1/3 mile on hill to the right) following the road into Worcester Road. Pass Images health club and Jewsons builders merchants on the right. Pass the Turks Head public house on the left**. For Senior School: After a further 50 metres the main Senior School gates are set back from the road on the left (South Gates). Park by the sports hall and follow signs to Reception. For Preparatory School: Continue past the Senior School entrance on the Worcester Road and at the mini-roundabout turn left into Charford Road. Continue to the traffic lights and turn left onto the A38 Bromsgrove Eastern Bypass. At next set of lights turn left into New Road. Turn immediately left into Bant Mill Road which becomes Old Station Road, the entrance is 200 metres on the left. For Pre-Preparatory School: Continue past the Senior School entrance on the Worcester Road and at the mini-roundabout turn left into Charford Road. Continue to the traffic lights and turn right onto the A38 Bromsgrove Eastern Bypass. At the next roundabout (Morrisons supermarket) go straight over and climb the hill. At next lights take the filter lane left into Hanbury Road, the Pre-Preparatory and Nursery School is immediately on your left. The A448 joins Hanover Street at the roundabout opposite the Market car park. Turn right into Hanover Street which becomes the Worcester Road after 200 metres From this point the instructions from Stourbridge marked ** apply. At the roundabout where the A448 dual carriageway from Redditch joins the Bromsgrove Eastern Bypass, take the second exit signed A38 (South towards Worcester). From this point the instructions from M5 North marked •• apply. Please click here to view the campus maps. 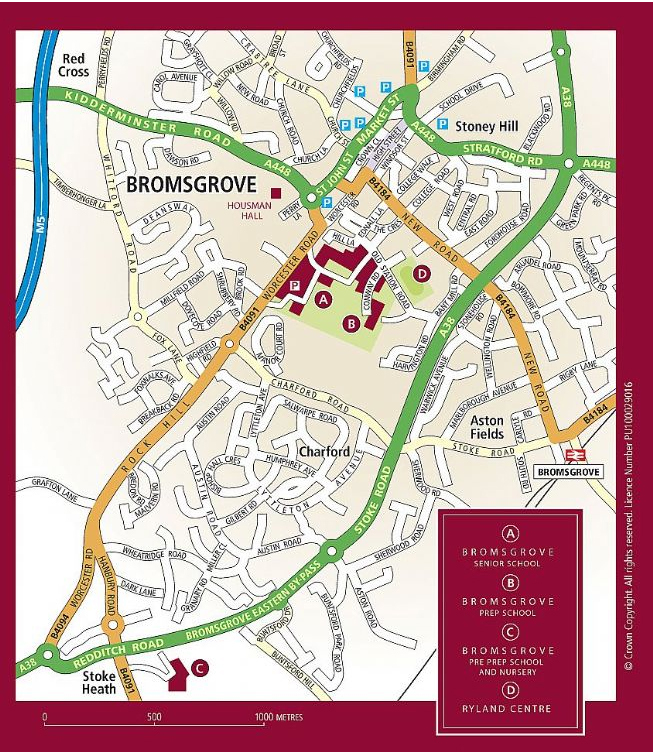 The main area for parking is via the Worcester Road entrance to Bromsgrove School. Click here for more information.